Fantastic childhood, totally different times and that is why I still live here, it is a great place to bring up kids. When did you start to love Rugby League? 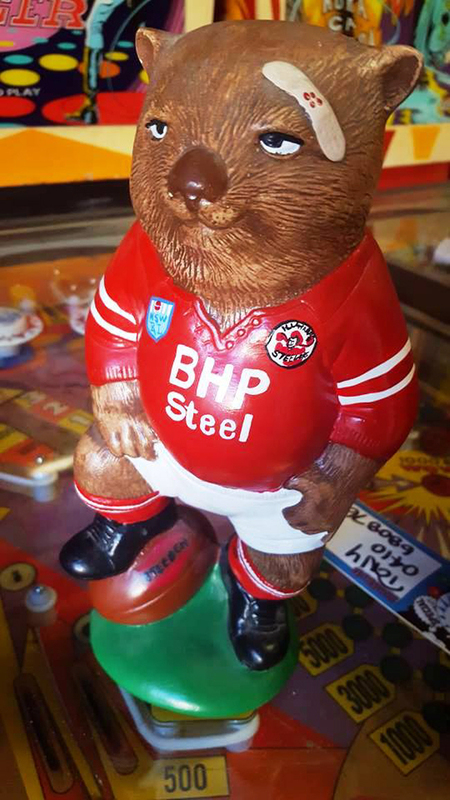 I followed rugby league from about 1970, I used to go for Manly and I followed the religiously until the Steelers came in. 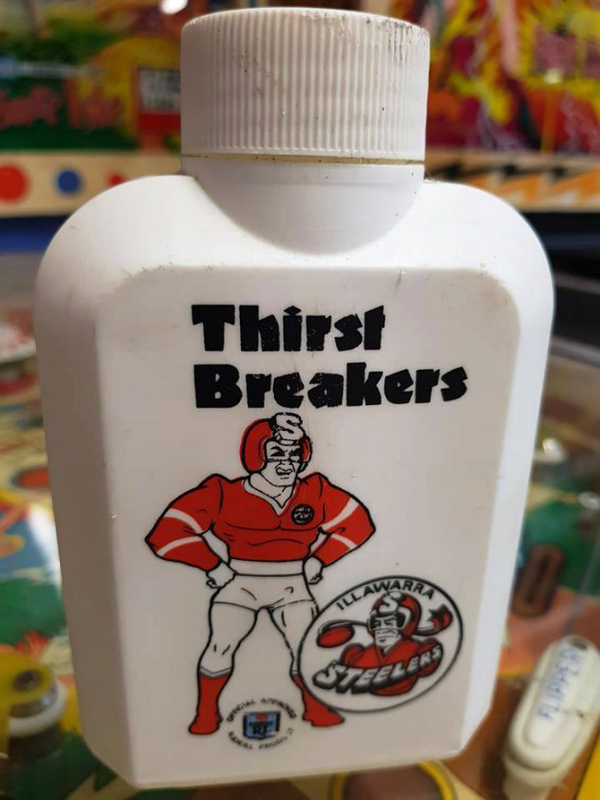 I went to their first game in 1982. 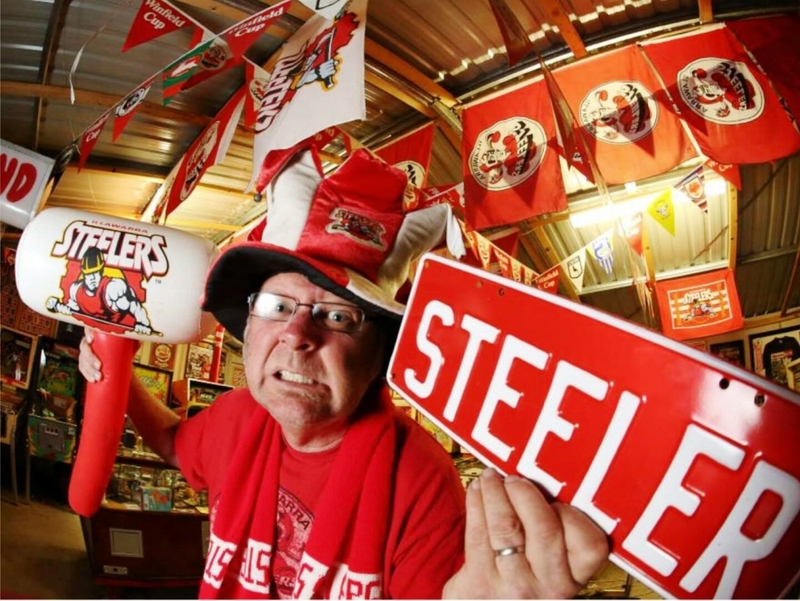 How was the atmosphere at the first ever Illawarra Steelers game? I was at the Penrith game, I stood on a flatbed truck on the southern end of the ground. It was when it was the old Wollongong Showground. I was still in high school and we were having beers and I remember being on the back of that truck being pretty pissed. 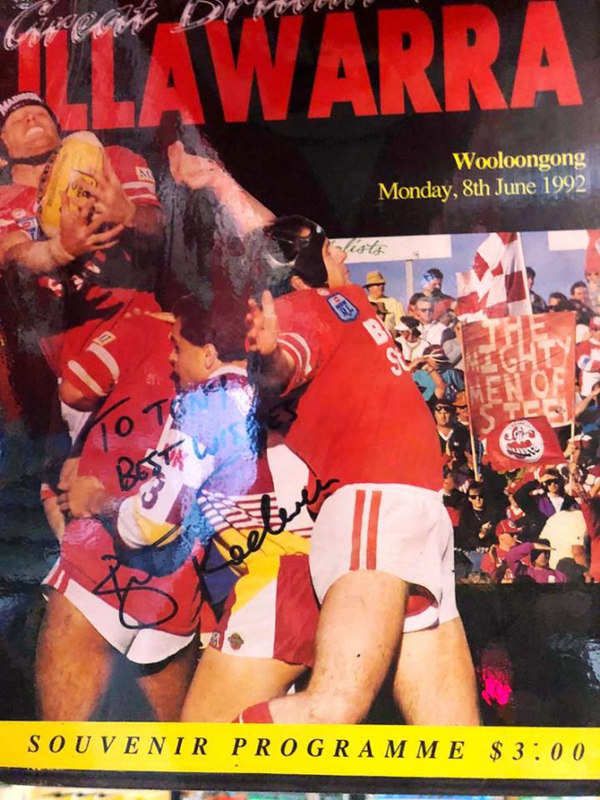 I was still a Manly supporter as I walked into the ground and I still supported Manly until the game when they played the Steelers in Round 12 and I remember John Dorahy kicked a field goal to win the game. 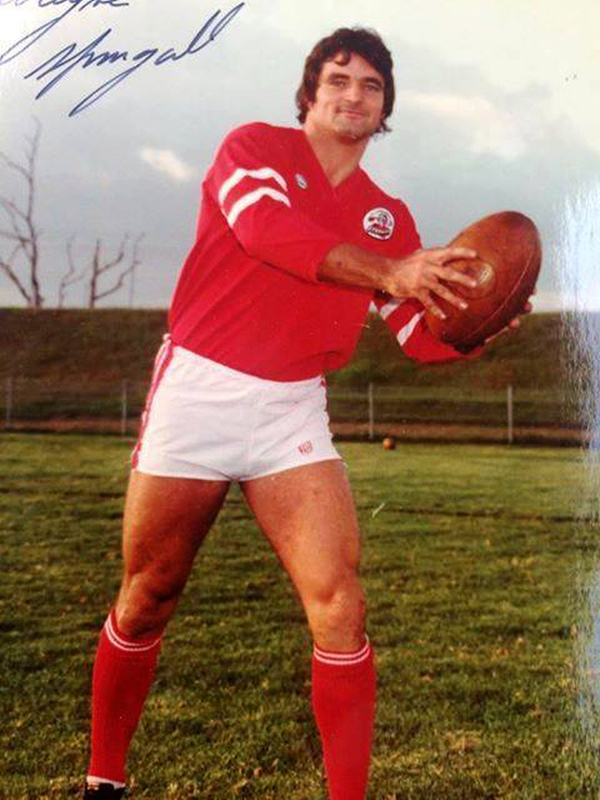 He actually played for Manly the year before. I remember my allegiance changing during that game. I walked in a Manly fan and walked out as a Steeler. How did your interest with the Steelers develop over the years? I used to go to all of their home games with my Dad, who is still around, he is 80 years of age. I used to go a bit later when my son was born, Josh, he is 27 years old now. 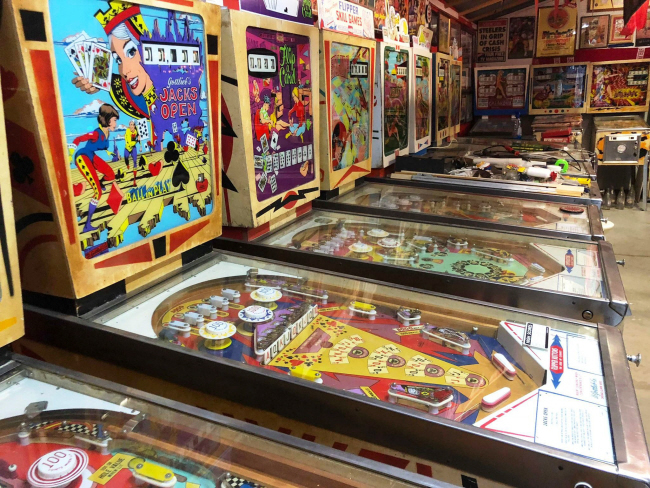 We used to go in to all of the games as three generations. 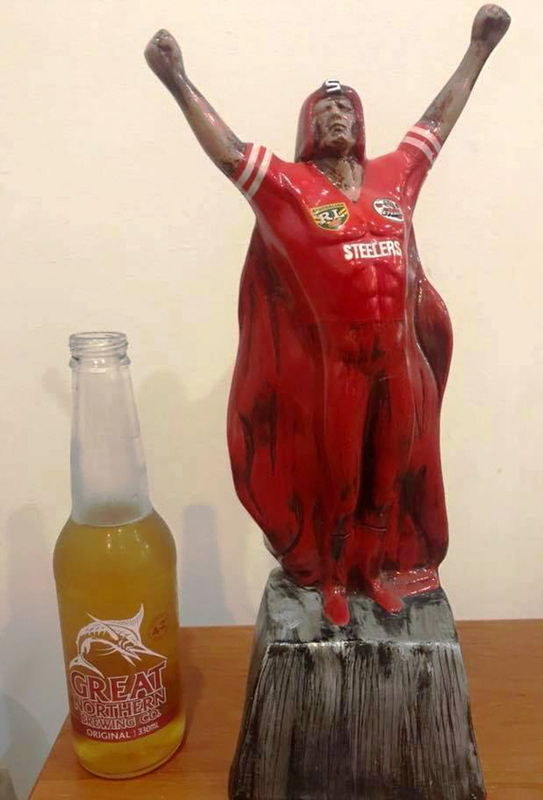 It was just a Wollongong team, Wollongong boys. They always gave their all. They were never the greatest team but they did their best playing for that jumper. Who were your favourite players when you were growing up? 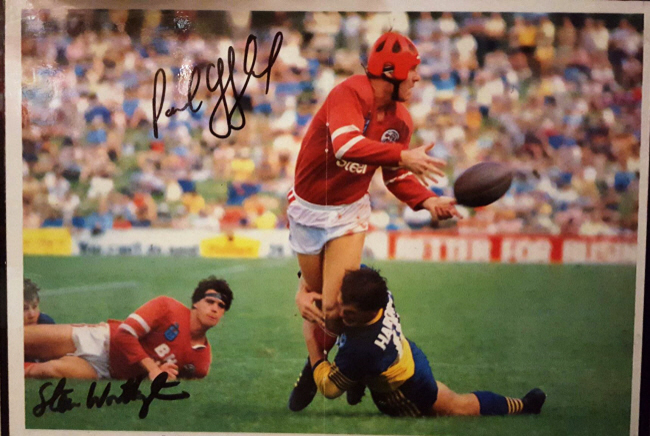 I suppose with Manly I liked Terry Randall, Graham Eadie, Tom Mooney, Russell Gartner. I remember meeting Bob Fulton and Frank Stanton. 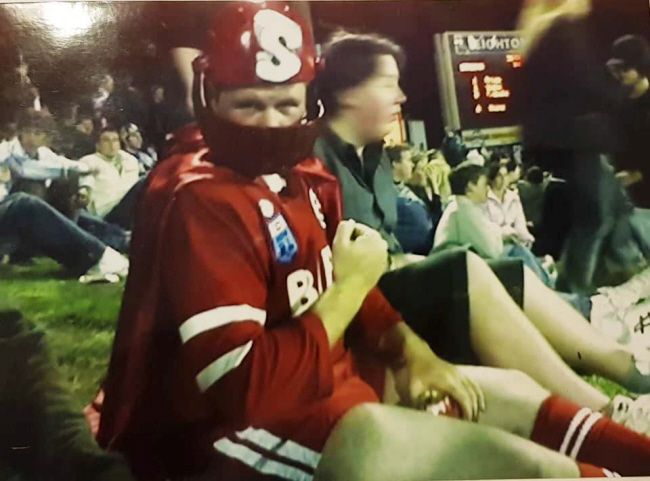 My father was a Western Suburbs supporter since he was a kid and I still remember going to the Wests v Manly games and the full on brawls which you see on Youtube now. I remember standing there watching those games. Who are your favourite Steelers players? Peter Johnston (He was in the room). My all-time favourite Steeler would be Trent Barrett. 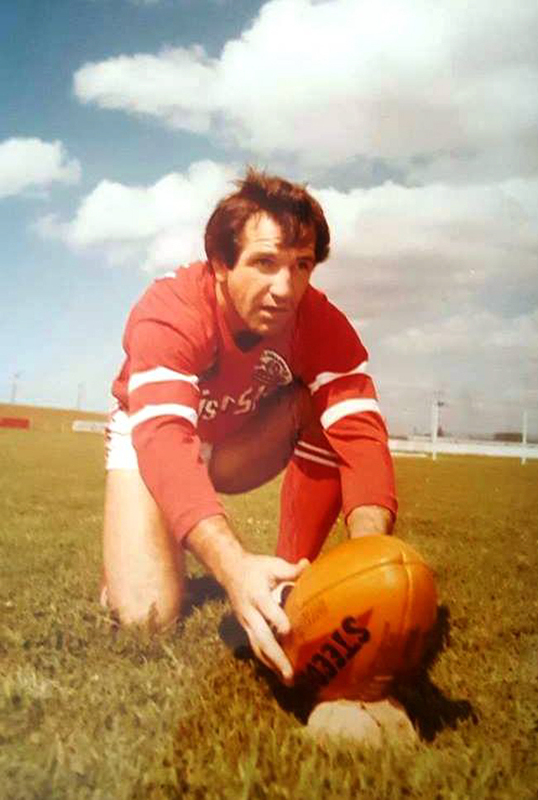 I just thought he was such a great footy player. I just think if the Steelers had of stayed as a club then he would of developed. 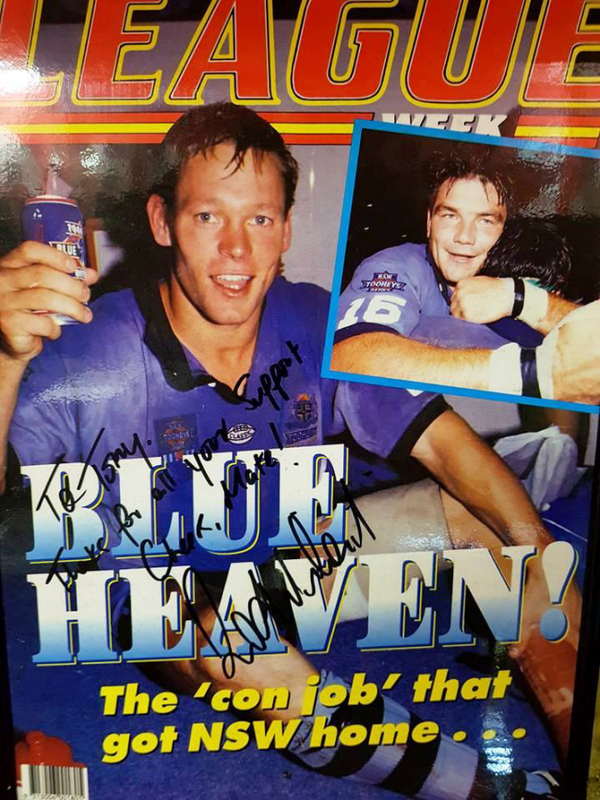 I always had a soft spot for Brett Rodwell, he was a lovely bloke. Craig Keen and Steve Hanson, those guys from the late ‘80’s, they weren’t super stars yet they played well above their weight. The local guys who always gave their all for that jumper. You need to think about the pre Steeler days, you had players like Graeme Langlands, Bob Fulton. Then you think about blokes like John Doarhy and Rod Henniker returned home. 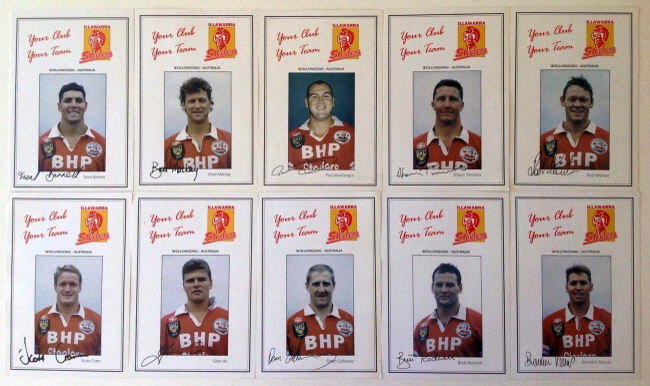 In the early days you had the experienced guys like Wayne Springall, Greg Cook, Brian Hetherington. 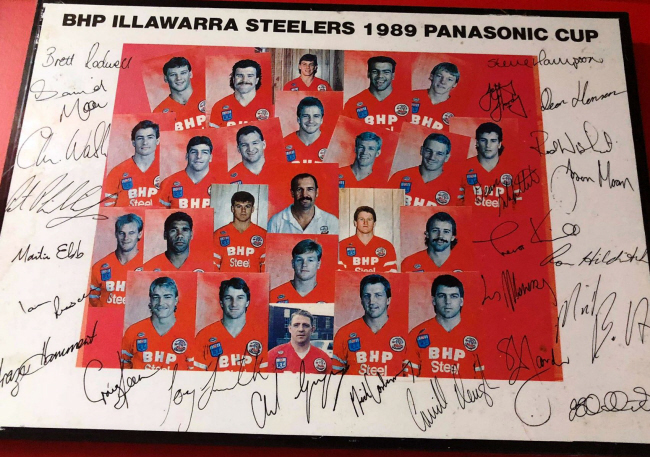 It really peaked around 1992, 1992 when there was that wave of Illawarra juniors coming through like the Rodwells, Paul McGregor, Ian Russell, Chris Walsh, there was just this great bunch of Illawarra players to represent the region. They brought Bob Lindner in 1993 and I remember talking to Bobby Steele in the shed about it and he said they brought him in to compliment Ian Russell. 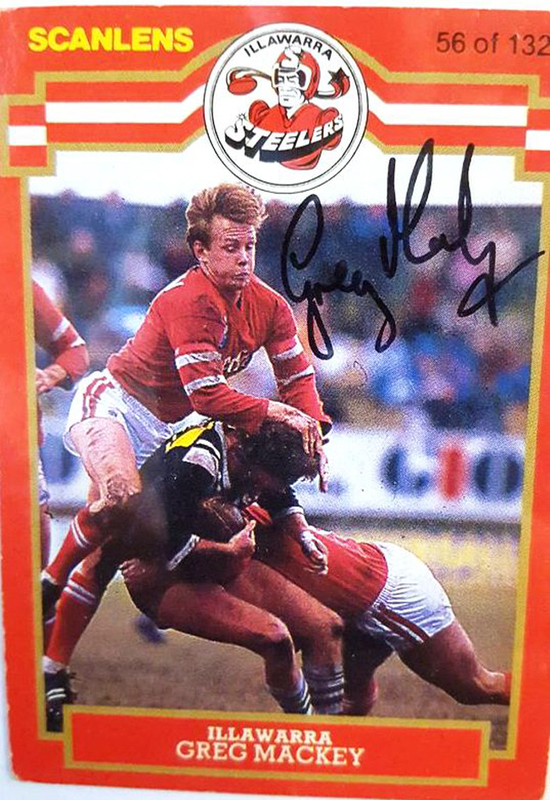 I always wonder if we didn’t have Super League, would they still be there? I support them, I never miss a game. It shits me no end when people call them St George. I don’t go to games anymore. I still watch every game, even if I am overseas, I find somewhere to watch it. 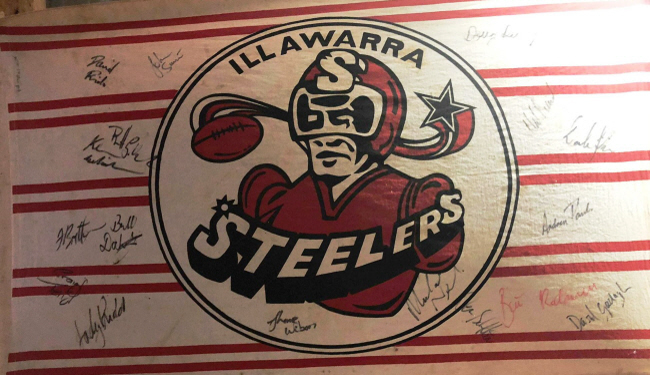 Tell us about your Facebook Group, Illawarra Steelers Fanatics? I originally started it because I picked up a scarf and I was wondering what else is out there, so I started the group and it just blossomed. I started it about four years ago. 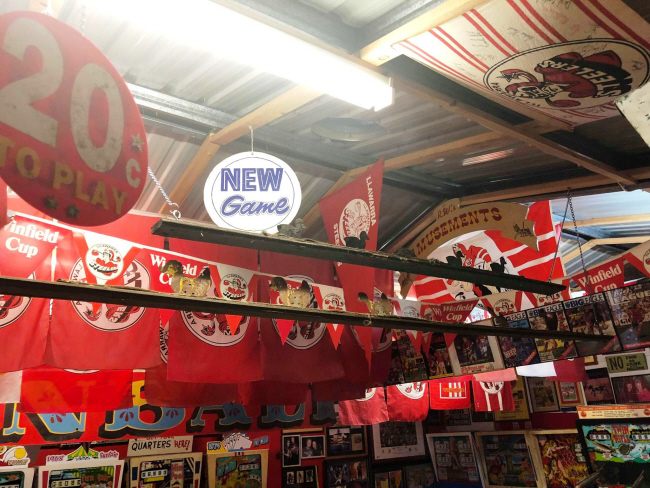 It has been a lot of fun; a lot of memorabilia has surfaced including a lot of player worn jumpers. A lot of former players and former players kids are on the page which is really nice. 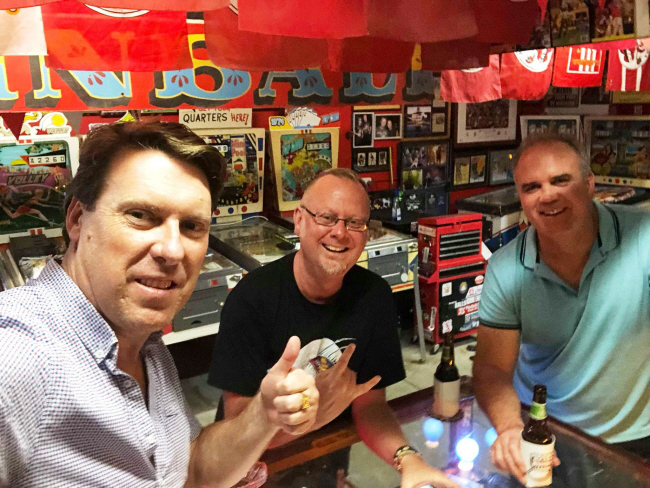 Players like Bolty (Michael Bolt), Dean Schifilliti, Wayne Springall, Rod Henniker, Paul McGregors wife is on there, she is in the background. John Cross, Alan McIndoe, Neil Picinnelli, John Dorahy, there are a lot, you put me on the spot. Are there any people from your page who you have met and become friends? 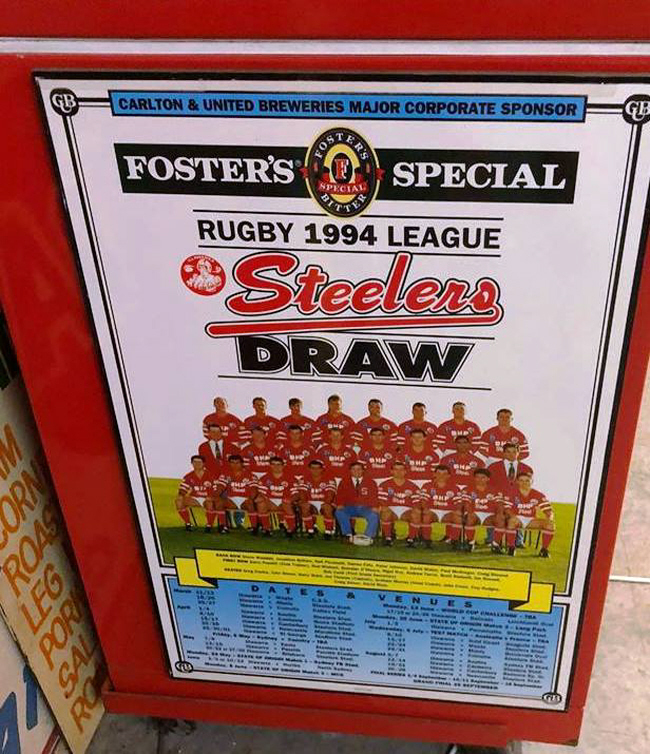 Yes, totally and what is really random is chance meetings, for instance I was in the que at Woolworths and somebody just started talking to me and he said “You are the guy who runs the Steelers page”. What stuff did you collect as a kid? As you can see, sitting in my man cave, I have always been a collector. 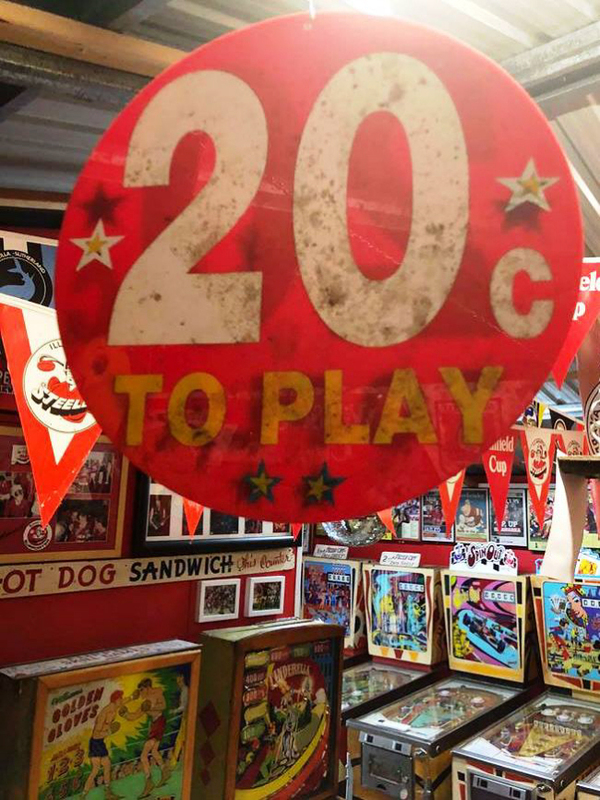 Even as a kid I collected pin ball machines. I collected my first one when I was 13. 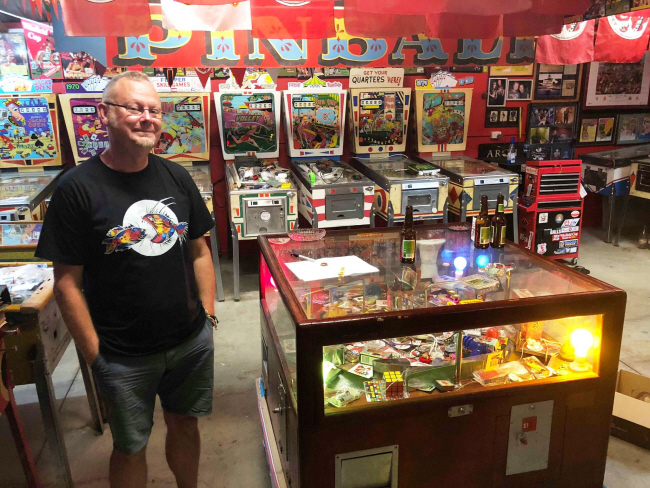 Talk us through your pinball machines? I have had close to 500 since 1977. My Mum bought my first one in ’77 for $30, which would be worth a lot more now. It would be worth about $5,000 now, it was called Buckaroo, 1965. I actually know where it is now and I can’t get it, that is the frustrating thing. I just loved how they worked so I bought another one, and then two became four and as I was in my late teens I started to buy and sell and made some profit from it. The ones in my man cave have come in from all over the world. Some are from America. I don’t have a lot of interest in the modern ones, this is the stuff I grew up playing. 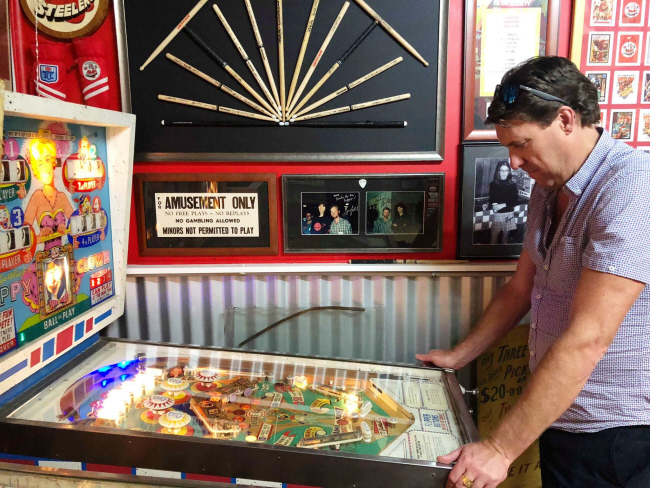 Is there an elusive pinball machine you haven’t managed to get? No, I have managed to get them all, there is nothing left. 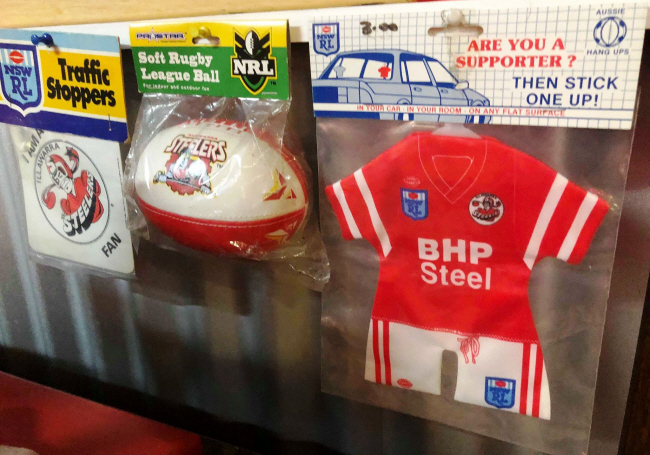 What Rugby League stuff did you collect as a kid? I collected footy cards. 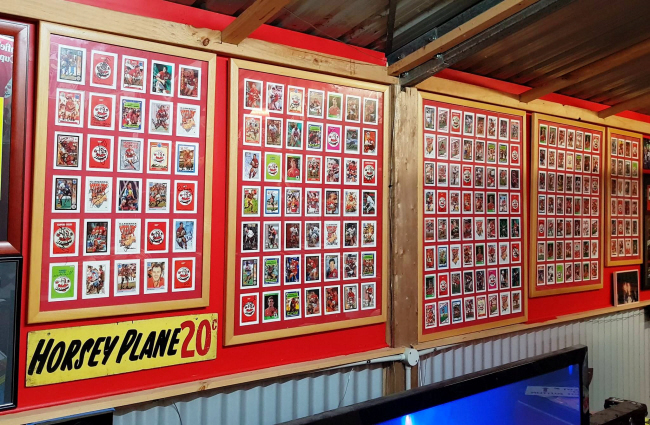 We used to sit in the school yard and get the full deck of footy cards and go through them all. 1974 would have been the first set I collected when I was in 4th Class. 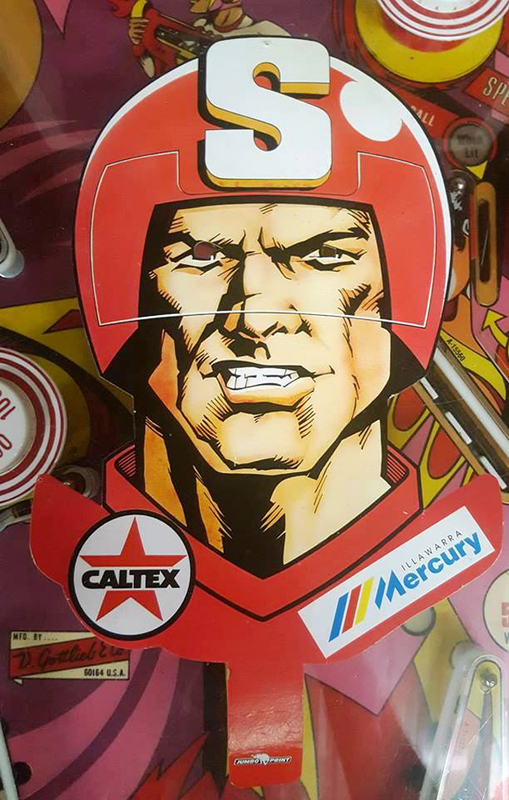 When did you start this Illawarra collection? 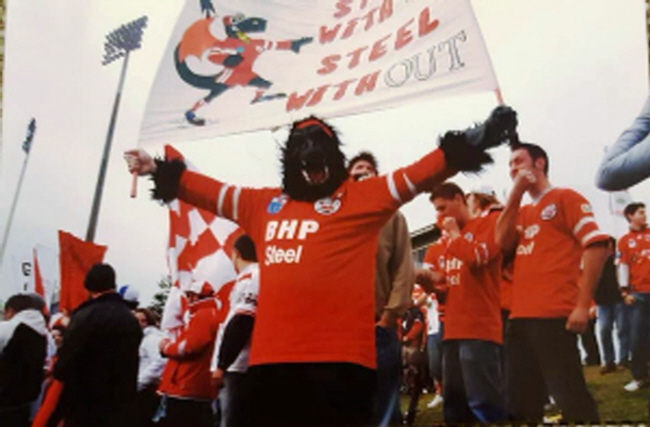 Mostly after they folded, I remember sitting there at their last home game against Canterbury in 1998 and I knew they weren’t coming back. Around that time eBay started to kick in and I remember picking up a scarf on eBay and I started to wonder what else is out there? Then I started to collect and just went nuts. 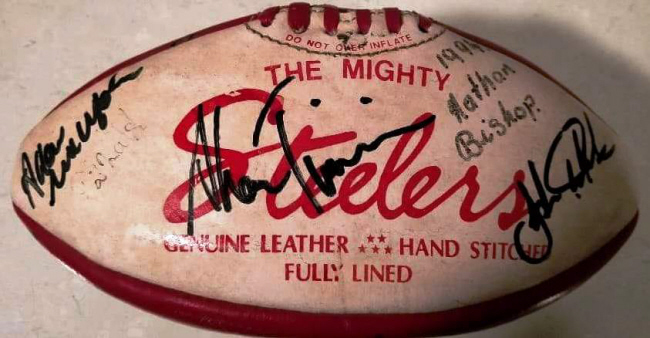 What are you favourite items you have collected of the Steelers? 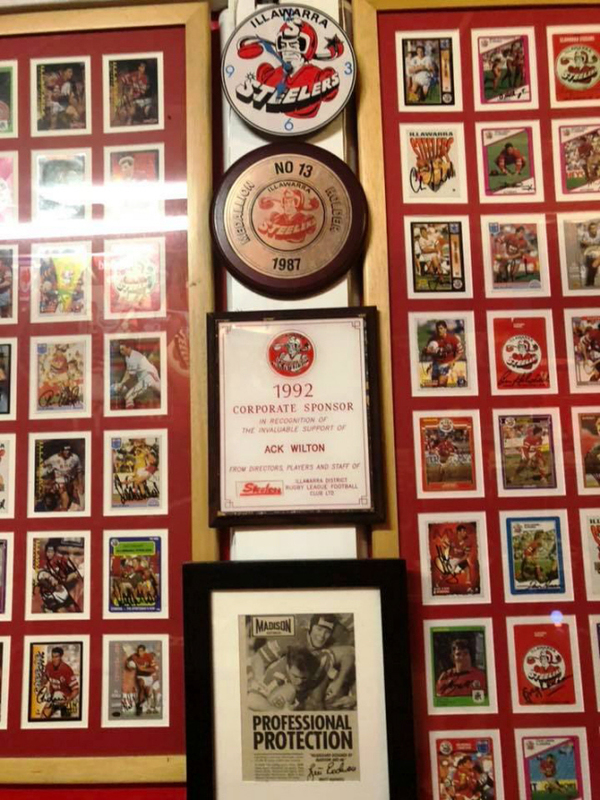 Well probably the cards, framed up on the wall there is every single regular card from Illawarra that ever came out. Every single one of them has been signed bar three. The three who haven’t signed at Mal Creevey who passed away. There is another player from the mid 1980’s who I won’t name who refused to sign it. I sent my cards off, including some rare ones and they never returned. Wayne McPherson who we haven’t been able to track down. We asked at the Steelers club and none of the boys knew where he was. There are a lot of other Steelers players who didn’t actually have a card and I got them to sign a club logo card. How have you tracked down so many steelers players to get all of these cards signed? Fortunately we had the internet open up and met a lot of other collectors, so there was a lot of networking to find where different players were. 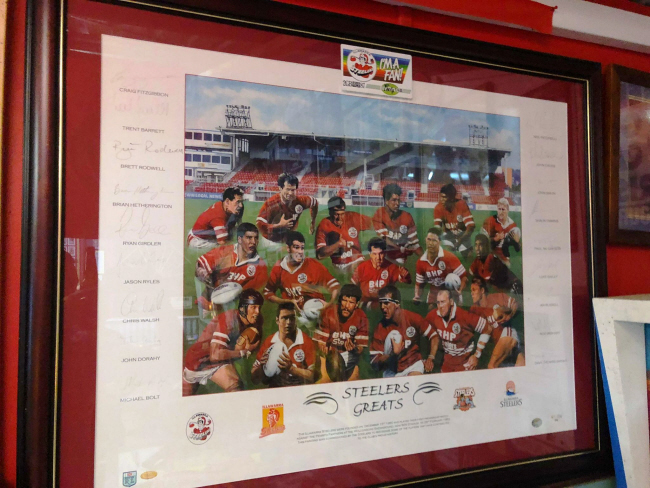 A lot of the boys are still down in the Illawarra region and a lot are involved with different clubs down here. In these cases it is easy to track them down. A few cards I sent to England to get signed. I managed to get a lot signed at club reunions as well. 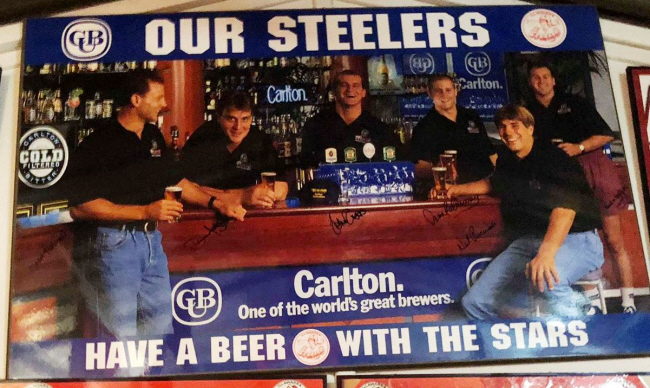 What are your favourite Steelers moment? 1989 Panasonic Cup would be my favourite. 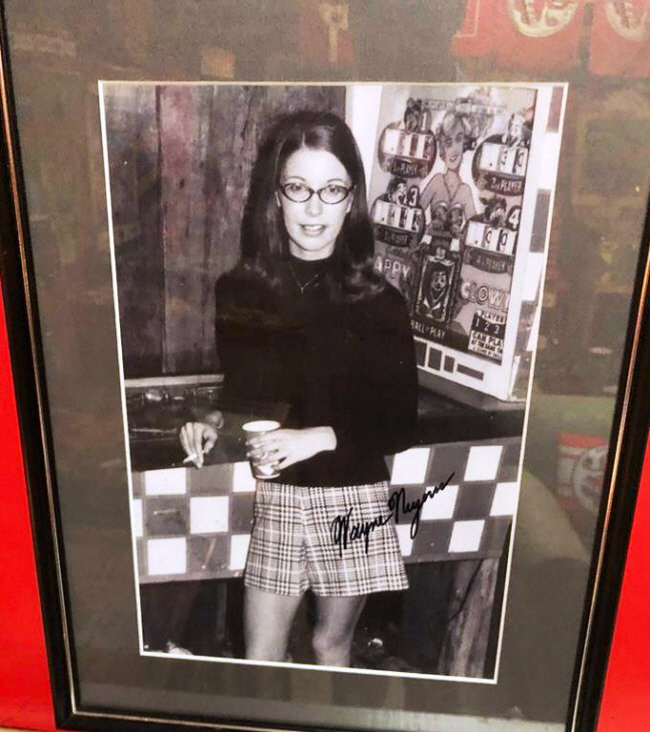 Tell us about your music memorabilia? 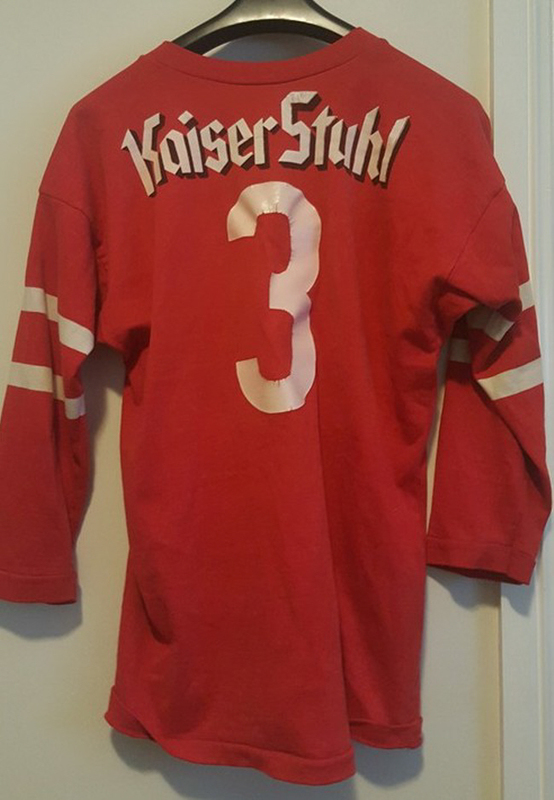 I have lots of music memorabilia, I have been fortunate to have been fortunate with all of the bands I like, I have gone overseas to see them. The best band I saw was Kiss in 1988. I have met those guys lots of times. I love music. I am actually 20% deaf in my left ear, it drives my kids up the wall. My son still lives at home, he is moving out soon and I get messages from my son at a quarter to twelve saying, can you please turn the music down Dad? What other activities fill your time? I have been happily married for 25 years with two adult children, Josh who is 27 and my daughter who is 22 and she has just about to have first child, so I am going to be a Grand Parent which is nice. I practice yoga, love gardening, I love my family, love my dogs and love my man cave.